When I was just a toddler, with a pile of curly hair, my mother brought me home a lovely duck. 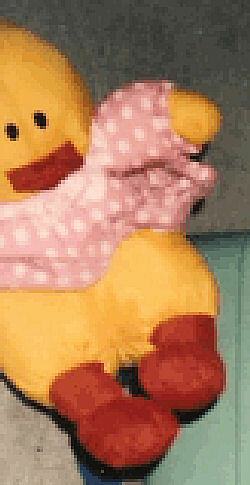 She was made of Puffalump like material, and was wearing a lovely pink dress with white polka dots. She has a tuft of white hair. She was not a Puffalump. She was an imitation. This duck is from about 1992. I really loved her, and she inspired me to make my huge duck collection I have today. While donating and packing plushies, my father accidentally donated this plushie when I was 7 in 1999. I really miss her, and loved to hug her, if anyone could please find her for me I’d really appreciate it. Thanks for all your help. This site is wonderful! I’m wondering if this is the boy version of the same duck? Maybe you could add to your collection? I don’t have the money on me right now, I’ll try to buy it. If anyone happens to see the girl, you can still message me, I’d gladly have the couple. This is adorable! Thanks a bunch! Oh my goodness I am looking for the exact same plushie!! Did you ever get your hands on another one? Or find out what brand/model she is? Oh I realize that these posts are from 2009… Do you have a picture of said male version of the Duckie? I’d love to see what he looks like! !